Our knowledge and experience at Mattress Moose has allowed us to carefully select a range of Mattresses which have been tried and tested, offering you the best in high quality mattresses. The right mattress is the most important feature within your home as you spend about a third of your life in bed, so you need to ensure that you consider the right type of mattress for you. Your mattress needs to provide you with the right balance of support and comfort based not only on your individual needs of how you sleep, but also on your personal preference of what you find most comfortable from past experience. Bed Frames offer an alternative mattress base to a divan and remain a highly popular choice. Bed Frames can be made from different materials including metal and a variety of woods such as pine, oak or other hardwoods to ensure that there is a choice for everybody and to suit every budget. At Mattress Moose we have a vast knowledge of bed frames and we have selected a huge choice of different wooden and metal bed frames to provide you with an option for every occasion. This variety of bed frames enables us to ensure that our bed frames can fit in with both traditional and contemporary styled homes. Divan bases are an alternative to a more traditional bed frame and they provide a sturdy and solid base for your mattress. Divans often feature additional storage options which can help to maximise the space you have available in your home. Divan bases still remain a highly popular bed choice as they are reliable, can come in different colours with different storage options and they are also an economical alternative to a standard bed frame. Our depth of knowledge here at Mattress Moose has allowed us to select a range of divan bases that offer a perfect base for any of our mattresses. We also showcase a range of feature worthy headboards that can also complement your new divan base. Headboards are designed to complement your bed and mattress and they help to add a decorative effect, enhancing the decor of your room. Something as simple (or as extravagant) as a stylish headboard makes a stunning focal feature in any bedroom and would be a welcome addition in any home. Headboards can even be added to existing divan bases to help 'freshen' up a bedroom and create a statement and with our extensive testing, we can assist you should you have any questions or queries about our range of uniquely styled headboards. The Rimini High Sleeper Student Set by Verona is a bed frame that features the sleeping structure above additional storage. This adds a more fun element to a night time routine and it also offers valuable space saving solutions too with additional storage being able to be introduced. 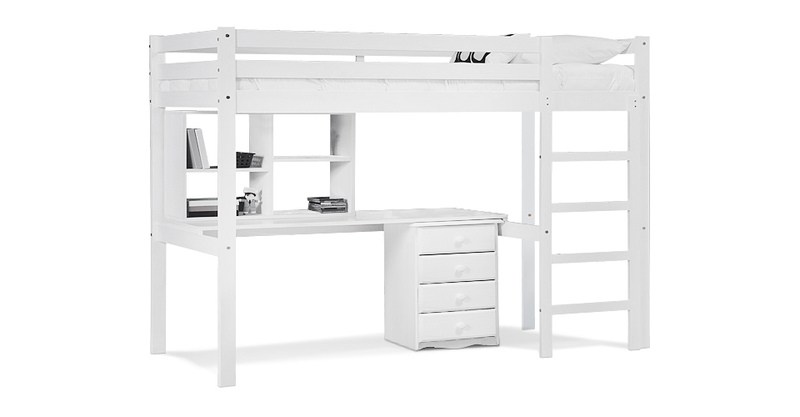 The Student Set features an inbuilt desk for convenience, helping you to save more space in your bedroom. The Rimini High Sleeper Student Set by Verona is made from pine ensuring a durable bed frame. You have 7 days of recieving your goods to inform us that you wish to return your product for a Full Refund, minus any delivery costs incurred for the return. All online payments are compliant with PCI security standards for your data protection provided by PayPal/SagePay. You will see a 'padlock' on your browser URL when on checkout to show that your private data is encrypeted and secure. Speak to an Expert Advisor via phone, chat or email. Please quote this Products's code 81046B to speed up your query if related.